Preparations are fully underway for what's going to be the biggest social surfing event of the year. The 50th annual Intercounties surf contest is running from Friday, October 19 to Sunday 21 at Rossnowlagh. The organisers have lots planned, including a fun team surf contest open to all (young and old, experienced or not), a special dinner and group surf in the Sand House Hotel in honour of Brian Britton, followed by a rock n roll party in a specially erected marquee to celebrate this anniversary event. Rossnowlagh Surf Club are calling competitors from all counties of Ireland to compete for this unique trophy which was won last year by landlocked Laois. You need 3/4 members on a team (it doesn’t matter what standard or age - it’s just about having fun). Registration is via the ISA website. The organisers would particularly love to welcome teams that have entered over the past 50 years like the Antrim and Down teams of the 70s, the Donegal teams of the 80s, the Deise teams of the 90s and 00s and the Sligo teams of the past ten years. Every year the event also attracts entries from Wicklow, Dublin, Laois and other landlocked counties and long may it continue. Entry is €20 per team. Following the competition on the Saturday, there will be a paddle out in honour of Brian Britton, the godfather of Irish Surfing. He was a proud Rossnowlagh man who through his love of the ocean, organisational skills and yellow pad and pencil helped bring the love of surfing to so many people all around Ireland. There will be a special meal in the Sand House Hotel at 6.30pm in his honour and to help celebrate 50 years of the Inter-counties. All are welcome to the meal, especially the ex-Irish Surf Team members, golden oldies and Silver Surfari surfers. The meal will be followed by a few tales from Brian's surfing days and trips with green Irish boys to Brazil, Portugal and Puerto Rico amongst other places. Tickets for dinner are available online at €25 each and must be pre-booked. After the meal the party starts across the road from the hotel at a large marque from 8pm until late. Local band 'The Fabulous Franks' and ACDC tribute band 'Whole Lotta Lovin' will be rocking it out on the main stage. There'll be food available on the night from the 'Beardyman' and the craic will be mighty. All the groggy heads will be up the next day for the finals which will be taking place at the best location in the region either the Peak, Tullan or Rossnowlagh at a reasonable hour with prizegiving in the Surfers Bar at 4pm. 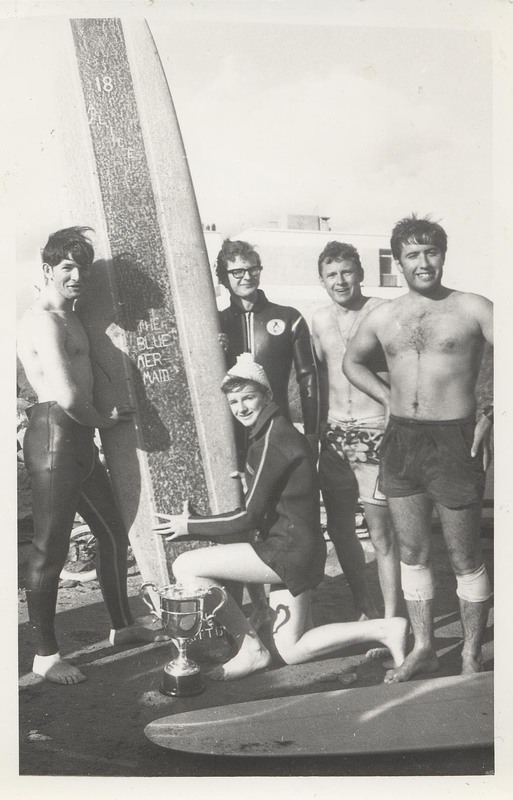 The organisers of next weekend's surfing event want to get as many surfers as possible to take part, young and old, from the teams of the 60s, 70s and 80s and teams of new surfers who've never entered. It's simple: grab three or four surfers from your county and log on to irishsurfing.ie. ISA membership is not essential but recommended for this one off event. The organisers also plan to organise a big paddle and group surf in Rossnowlagh at 4pm on the Saturday in memory of Brian Britton who gave so much to Irish surfing. Tickets are on sale for a special meal, and also live music on Saturday night. Any profits made from the night will go into Brian Britton Memorial Fund for Junior Surfers from Rossnowlagh Surf Club to continue his legacy and help as many junior surfers as possible in the Rossnowlagh area. Also keep an eye out for the Barry Britton deigned 50th Intercounties Surf Poster.